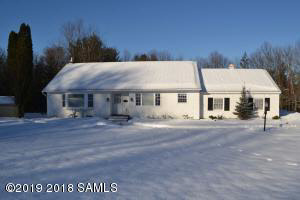 Lovely home sits on 1.3 acres at the end of a cul-de-sac, semi-private and surrounded by trees on the side and back of home. Large open bright kitchen, tiled bathrooms, newer windows, new garage door, new gutters, family room with built-in book shelves, open floor plan, hardwood floors and vaulted ceilings. Home renovated about 4 years ago with updated kitchen, water heater, electrical and bathrooms. Walkout basement with gas fireplace, large back deck overlooking private yard. 3 storage sheds (one is 23x11).